You may remember last year when a photograph of Alan Kurdi was featured on the front page of newspapers internationally. The photograph of a young child's lifeless body on a foreign beach was a cause of shock and anger worldwide. The injustice of an innocent child's death appalled millions, and it was universally acknowledged that something must be done to stop the unnecessarily tragic deaths. But what was done? After the hashtags stopped trending and the papers started to concentrate on other stories, how many children's lives were saved as a result of our outcry? Few, if any. Upwards of 4,500 children's deaths have been confirmed in Aleppo (Syria’s capital city) alone. The fighting continues, as do the often lethal journeys from one shore to another in search of safety. The rejection and outright racism these refugees face on an international scale is just as prevalent as ever. 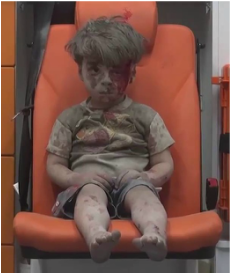 More recently another photo, of a 5 year old Syrian boy, Omran Daqneesh, made the headlines. You've probably seen this picture too and been equally as appalled by it as you were by Alan’s picture last year. Omran is pictured in the back of an ambulance on his own, covered in blood and debris after being pulled from the rubble of his family home in Aleppo. He has become yet another symbol of the atrocities being committed. But Omran, just like Alan. and just like all children caught up in the war, is being continually ignored by the West. How many children need to suffer before it becomes more than a front page picture? We don't need any more symbols of suffering, especially not in the form of children; we need action and front line aid. The lives of Alan and Omran, and all children caught up in the brutality, are irreversibly damaged if not entirely destroyed. Children as young as these scarcely know a life without conflict, but without substantial aid and asylum from the West we can only expect the death toll to rise further.